Hirokazu Kore-eda steps away from the gentle family dramas that made his reputation for a complex murder mystery. Misumi (Kôji Yakusho) has beaten and killed an industrialist. He turns himself in and confesses to the crime. The case could not be more straightforward until defence attorney Shigemori (Fukuyama Masaharu) arrives, determined to do all he can help his client avoid the death penalty. Challenging assertions, seeking out inconsistencies and refusing to take anything at face value, he seeks to obscure the truth in order to save his client. The Modern Families strand features one of the hottest anime properties to have gone global and it should be a guaranteed hit for fans of Studio Ghibli. 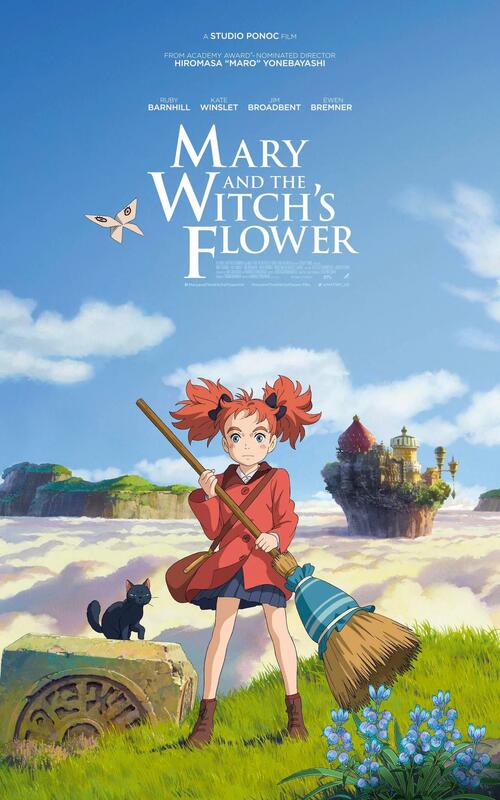 This is the UK premiere of Mary and the Witch’s Flower, directed by Hiromasa Yonebayashi (Arrietty, When Marnie Was There) and animated by many talented people from Studio Ghibli. Synopsis: The director of When Marnie Was There returns with a thrilling animated adventure based on the Mary Stewart classic The Little Broomstick. Mary is sent to live with her great aunt in the countryside. Venturing into the woods, she discovers a mysterious blue flower that only appears once every seven years, and an old broomstick. Soon she is soaring beyond the clouds to a city in the sky where Madam Mumblechook presides over the Endor College of Magic. An absolute charmer that young and old alike will love. The film will be the directorial debut of anime screenwriter Mari Okada (The Anthem of the Heart, The Dark Maidens) and it will be animated at P.A. Works. Synopsis: Acclaimed screenwriter Mari Okada makes her directorial debut with this animated fantasy feature. The people of Iolph have a lifespan of hundreds of years and maintain their teenage appearances for life. When an army invades their peaceful town, seeking Iolph blood and the secret of their longevity, a young girl named Maquia is forced to escape. Wandering the land alone, she encounters an orphaned baby in the forest. Maquia chooses to raise him, but as the boy grows older, her looks remain the same, throwing the difference in their lifespans into ever-sharper focus. Junk Head has been invited to many different film festivals such as Raindance last year. Synopsis: Hundreds of years in the future, life on Earth has become a withered mess. Human reproduction has been abandoned. Armies of clones, developed to help aid the dwindling workforce, have revolted and carved out their own world – underground. Once peaceful beings, the clones have evolved into unrecognisable beasts, with many vying for global destruction. One human’s mission to explore this world evolves into a journey of discovery and a fight for survival. Four years in the making, Takahide Hori’s much-anticipated dystopian masterpiece questions our perceptions of society. The trailer I found is a compilation one for a horror film festival with films like Jeepers Creepers and The Fog and a couple of other titles. The third film featured is Vampire Clay. Synopsis: Do you ever feel like the eyes of an artwork are watching you? In Vampire Clay they most certainly are! The debut feature from Sôichi Umezawa, who made waves with fan-favourite segment ‘Y is for Youth’ in The ABCs of Death 2, Vampire Clay evokes the hedonistic heyday of effects-driven ‘80s horror. The story bridges the divide between outrageous and obscene, focusing on a rural art school that is terrorised by sentient demon clay. Gallons of clay and fake blood are mixed to produce one hell of a ride that channels The Thing and The Evil Dead. Synopsis: For one night only, immerse yourself in the world of hit anime franchise Attack on Titan at a top secret location. The Roar of Awakening recounts events from the show’s second season, which sees new threats and a fresh Titan invasion test the members of the Survey Corps to their limits. With incredible action and shocking revelations aplenty, there’s no better way to witness the continuation of Attack on Titan’s dark and mysterious story.